For more than two millennia, Judeo-Christian culture has been waiting for the end, time and history ticking slowly towards their supposedly inevitable conclusion. But although the end stubbornly refuses to come, we cannot help ourselves: from nuclear winter to global warming, from inter-planetary collisions to the Y2K bug, our cultural imagination constantly seeks out dire predictions and invests dates with apocalyptic significance. For those not familiar with the name, William Gibson is the man whose 1984 novel, Neuromancer, is generally credited with having coined the term “cyberspace” (although Australian writer Damien Broderick probably beat him to it, technically speaking), and who, in the two novels that followed it, mapped out a vision of a future which was as exhilarating as it was terrifying. That first sequence of novels, the Sprawl trilogy, was followed in 1992 by the Bridge novels, Virtual Light and (in 1996) Idoru. All Tomorrow’s Parties forms the coda to this second sequence, and a remarkable coda it is, replete with Gibson’s stylish, often startlingly beautiful images of a world increasingly subsumed in virtualities of its own making, the inexorable narrative movement for which Gibson is justly famous, and a strange, haunting and ultimately profound re-imagining of what the end of the world might look like. As with Virtual Light and Idoru, the future of All Tomorrow’s Parties is a more tangible future than that of the Sprawl novels, and more unsettling for it, a media-saturated not-quite-now which has the uncanny familiarity of déjà vu. Like Bret Easton Ellis, Gibson has a fascination with the surfaces of contemporary culture, with the almost fetishistic power of things and images to evoke, their power to take on meanings of their own. Echoing Barthes, a character in Tokyo glimpses this power in “the towers of Shinjuku, the walls of animated light, sign and signifier twisting toward the sky in the unending ritual of commerce, of desire. Vast faces fill the screens, icons of a beauty at once terrible and banal.” Texture overlays texture, present and future refracting through each other, altering each other. And so, from his refuge in a Tokyo subway station, Laney tries to reach this nodal point in time to predict it, for in a twist on his Cassandra-like power to see the future coming, Laney can only see change coming, not what that change might be. To accomplish this he draws in others: Rydell, the soft-hearted security guard from Virtual Light, no longer a star in the making on the tabloid television show, Cops in Trouble; Chevette, the former cycle courier and no longer Rydell’s girlfriend; Rei Toei, the idoru of Gibson’s last novel, not quite a person, but an idealised virtual being, created to embody the fantasies of a world drunk on celebrity, “the ultimate expression of entertainment software”. Yet even as Laney drives his agents towards the centre of the puzzle, other players, players with quite different agendas begin to intrude: the Lucky Dragon mini-mart chain’s new nano-fax service (physical objects replicated from the molecular level up, anywhere in the world); the enigmatic billionaire Cody; a silent assassin hired by Harwood who is hunting Rydell. The event that awaits them, the “mother of all nodal points”, is a strangely anti-climactic one. Yet that sense of anti-climax is much of what gives this book its power to haunt. Like its title, half promise, half elegy for parties that shall never be, it is a strange, ambiguous moment, where the perfection of the virtual and the flawed reality of the flesh meet. 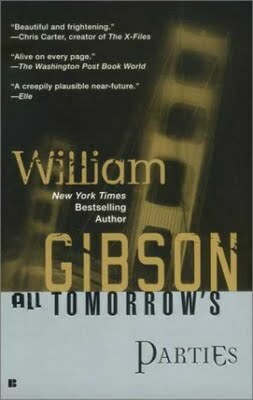 And, in one strange, subtle moment, Gibson both subverts and fulfils the apocalyptic imagination we seem so unable to escape. Even as worlds end, new ones are born, and tomorrow is always another day. First published in The Sydney Morning Herald, 1999.